Lachen’s most shining gem of all, Chopta Valley lies sprawled at an altitude of 4023 m on the way to Gurudongmar Lake. Despite of being a tourist hotspot, Chopta valley is able to maintain itself as a pristine and tranquil destination. The tourist looking for a peaceful getaway even from the hullabaloo of the other tourists, can visit this quiet and serene valley. 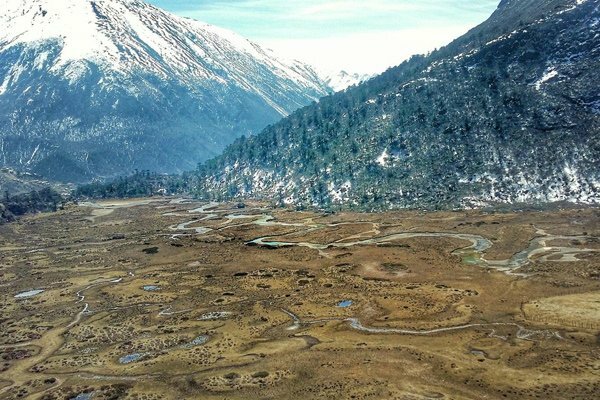 The place has got the majestic view of the snowy peaks, its slopes covered with pine forest and the grazing fields around the river meandering throughout the valley, make it an ideal place for the trekkers and explorers. It is the safe haven for many rare species of birds and animals, that allures many birders and wildlife lovers to visit this place. Its river is well stocked for the anglers and well-flowing for the water sports adventurist. People often plan a combined visit to Chopta Valley with Gurudongmar Lake; a sacred lake, which is just a few kilometers away from it. Then there is Tso Lhamu Lake, about 9 km from Gurudongmar, famous for being the source for the Teesta River. An hour drive from Lachen can reach you to the scenically blessed Thangu Village, to dwell into the nomadic life of the native tribes. From here Thangu Valley is just a little walk away, which is quite famous amongst the tourists for the Yak race. It takes around 7-8 hours drive from Gangtok to reach Chopta Valley. But mostly Lachen which is just 30 km away from Thangu, provide as a resting place for the tourists who wish to visit Chopta Valley. The adventure seekers opt to enjoy the mesmerizing scenic trek to reach Chopta Valley while others can rent a private taxi to reach up there. Summer season that extends from the month of March till May, offers the pleasant climate to the tourists to visit Chopta Valley. The maximum temperature during these months go up to 30°C and minimum to 10°C. Whereas during winters, the valley is mostly frozen.